This online apologetics and discernment ministry (OADM) Apprising Ministries continues to do our part to alert you to increasing syncretism within apostatizing mainstream evangelicalism. Following below I give you another example of how what should be important doctrinal differences are rapidly being obscured. Consider Jesus Culture’s Kim Walker-Smith’s Alleged Encounter With God The Father And Jesus Christ. Kim Walker-Smith (KWS) is worship leader with, and executive team member of, Jesus Culture—which is a ministry that extends from Bethel Church (BC) of heretical New Apostolic Reformation (NAR) pastor Bill Johnson. In addition, KWS is/has been worship pastrix at the BC. Once these NAR wingnuts were relegated to the hyper-charismatic shadows on the very outskirts of evangelicalism. However, a few weeks ago Louie Giglio made the ill-fated decision to bring in BC’s Jesus Culture in to minister to his Passion 268 Generation. Evangelical luminaries John Piper and Beth Moore also shared the platform with Jesus Culture at Passion 2013 further validating this group/movement that had, until then, been pretty much under the radar within mainstream evangelicalism. 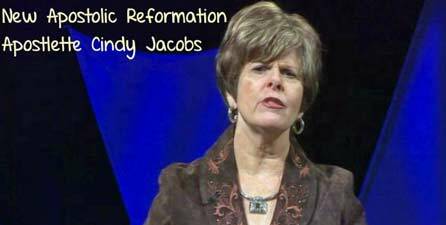 Which brings us around now to NAR “Apostle” Cindy Jacobs. As I’ve said before, if your spiritual discernment is so far off that you truly can’t see this woman is absolutely a false prophet, and you actually think she’s speaking for God, then you’d best question your own relationship to Jesus. And yet, we find out that Cindy Jacobs is a regular speaker at Jesus Culture events. This gives you another clear depiction of just how extremely off-target this Jesus Culture Movement is. Again, keep in mind here this all is an extension of heretical Bill Johnson’s BC, and together they’re so spiritually obtuse that they would, not only be promoting the work of Cindy Jacobs, but think they’re learning from this false prophet.